It has a similar toggle switch like any other circuit breaker and a test button to check whether it works correctly, in this case, the yellow button. If you press the button and the RCD triggers then it works correctly. It is important to remember that a RCD should be tested regularly to ensure proper operation. The recommendation is to check it every month. Ok, nobody does that but at least try to test it once or twice a year. This is the most common cause. Let’s say that 60% of cases of nuisance tripping are just due to a RCD not working properly . Your electrician may check the correct operation of the devices with a RCD checker, a piece of equipment all electrician should have. 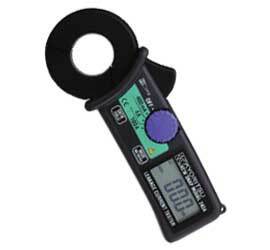 This device measures the sensitivity of the RCD regarding amount of residual current allowed and time to trip. If the RCD is more than 15 years old then is even more likely. Even though RCD looks good, the first thing to do is to replace the device. In cases tripping goes on you will have to check the other two possibilities. In this second case, the reason for the tripping is due to a leak of current. A residual current occurs when an electrical wire is poorly insulated or is in contact with an element outside of the electrical installation. It also happens when any electrical device that is connected, especially those that are grounded, i.e. a washing machine o dishwasher, has a defect in insulation and there is a current flowing away through the socket earth prong. If the defect is in the home wiring, it is likely to be in wet places like the bathroom or kitchen. In these cases, the cable is worn out and the insulation (plastic part or kind of cloth in older cables) does not protect the copper making some small contact with the wall or a part of the wall socket. In that case a small part of the electric current is derived through that contact. I commented that the electrical current needs a circuit through which to pass. That means the current goes in through a cable and out the other (it’s a bit more complicated but for simplicity …). In case there is a bypass, the current goes through a wire but a small portion goes off and does not return by the other cable and that is what RCD detects, the difference in intensity going in and out of the wires (between phase and neutral to be exact) and, when it is above a certain threshold (typically 30 mA), the RCD trips. If you have noticed that the tripping happens more often when it rains or after putting a washing machine, etc. it is quite possible that the problem is related to moisture. A wire touching the wall does no conduct at all when is dry but it does when is humid. This is also the case if a person touches a wire with electric current. The current passes through the body and goes out at any point into contact with the walls of floor, such as the feet. In this case, the RCD trips to save our lives from electrocution. This is the fundamental reason for the presence of RCDs in housing, to prevent accidents with electric current to be really serious. Returning to the subject, in the second case the defect is in electrical home appliances, such as the kitchen ones. In this case, a device that internally has a bypass transfers some power to the ground and again the input current will be different from the output and the trip will occur. This clamp works as an RCD, when it embraces the two wires that carry the electrical current determines the difference in intensity between the two and shows if a leak is occurring. Following the wires from the main board to outlets or lights we can determine the point where the leakage is. The diagnosis is not easy, it may be necessary to uncover many junction boxes of the house to figuring out where the leakage is. You can shorten the search considering that most situation occur in humid places of the house, in the kitchen and bathrooms or in the porch. Finally, in some cases the problem is there are high frequency currents in the electrical circuit. those are usually produced by electronic devices such as computers or any other piece of equipment that has a power supply of low quality which does not filter electrical harmonics. The electrical current is 50 or 60 Herz depending of the country. This means it changes polarity o «oscillates» 50/60 times per second. Harmonics is a change that is faster than this, for instances a change in current that happens 120 times per second. Many electronic devices put in the electrical network this kind of harmonics which do not affect the electrical supply to devices but prevent proper operation of RCDs and made them to trip. To detect that situation an «electrical network analyser» or «quality analyser» is needed. This piece of equipment is usually more complex to use than the clamp discussed above and not all electrician own it. So in many cases the diagnosis of this case is made by exclusion. If both two cases above are discarded, we can deduce the problem comes from high frequency currents, specially in houses with many electronic devices or powerful equipments as heating or air conditioning ones. A good indication of this fact is whether there are other houses with the same problem in the neighborhood. To solve the problem in this case a RCD called «super immunized» has to be used. This RCDs are not affected by high frequency currents and will trip only in the right situation, for a defect current. 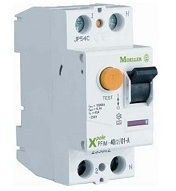 This RCD is quite expensive, around 150 pounds or 180 euros and have the letters «SI» written in the front. Simply replace the RCD by one of them and the problem of power outages disappear in many cases. This «super inmunized» name is kind of commercial brand started by Schneider Electric but it really means a RCD which will actuate just in the exact cases it has to. Depending the country you live it may impossible to find with that name then ask for a RCD type AC. Is interesting to comment there are also RCDs which re-arm automatically after some minutes. Those are very useful for houses that are frequently uninhabited so there is always electrical supply for the burglary alarm. Nuisance tripping is a relatively complicated fault requiring patience. In some cases, analysing the fault, you can find the source of problem but many others will require an electrician with experience in that kind of situations. This shows real expterise. Thanks for the answer.